The summer holidays are nearly over and it’s time to plan a visit to the London Library. 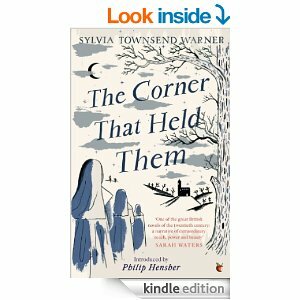 Looking at my pile of library books, I realised that I hadn’t got very far into Sylvia Townsend Warner’s The Corner That Held Them. I’d got distracted and had forgotten about it. I decided it was worth trying again. It’s a favourite book of a very good friend, and anyway, I’m an admirer of Townsend Warner’s short stories.. I don’t usually care much for historical novels. They are so often anachronistic in the way they present their characters’ thoughts. But The Corner That Held Them is an historical novel like no other. It is the story of a Fenlands convent between 1345 and 1382, the time of the Black Death and the Peasant’s Revolt. The landscape, the weather, the characters of the nuns and their habits of thought are all so vividly realised. It is full of strange, yet convincing details and similes. Dame Isabel on her deathbed is ‘mute as a candle, visibly consuming away and still not extinguished.’ Of another nun: ‘Her apple-blossom beauty had not been substantiated by the slightest carnal intellect, she was as chaste as a parsnip.’ There isn’t really a plot, and yet one is drawn on and on by her descriptive power. Sylvia Townsend Warner is one of those writers who seems to come in and out of fashion. I think she is one of great short story writers of the twentieth century. She is clever and funny and so original. I’ve just got her Selected Stories down from the shelf and, dipping in, want to read them all again. For anyone coming new to her, I think that would be the place to start. Good to hear from you, Lyn. I have just started reading them again. They are wonderful, aren’t they. I’ll have a look at Why I Really Like This Book. I liked this one, but found it a little slow-moving. I loved Lolly Willowes, which I read for the first time fairly recently, but my favourite is The Flint Anchor, a family saga. I want to read it again now…. I bought a copy of Lolly Willowes in a second-hand book shop a couple of years ago. Must get round to reading it. The Flint Anchor also.